Welcome back to another week of Fantasy basketball. We’re into November now, closing in on one-sixth of the season complete. Milk that wire, Fantasy hoops peeps! This week, Lonzo Ball’s rookie season continues to have its ups and downs as now he’s dealing with the distraction of his kid brother’s arrest; Cleveland, which is already taking a hit when it comes to betting odds to win NBA Championship, is now without Derrick Rose (ankle); and Kevin Durant (thigh) was sidelined Wednesday, but was expected to return to action Saturday. Aron Baynes, C, Boston Celtics (ESPN: 4.9 per cent; CBS: 9 per cent): Baynes has played five NBA seasons in relative obscurity, but he showed what he’s capable of on Wednesday, starting for the currently concussed Al Horford. Baynes flashed a nice offensive touch, canning eight field goals on 12 tries en route to 21 points with eight boards and three assists in just 23 minutes. Deep league owners need to start paying attention as he’s played at least 21 minutes in three of the last five games. He’s not the best rebounder in the world relative to his size, but he’s known for his toughness. Last season, he didn’t dress in as many games for Detroit as the season before, but he’s getting more touches in Boston than he ever has. Just don’t expect any treys — he has exactly one in his career. Horford remained out on Friday, giving Baynes another start, but even after Baynes returns to the bench he can still be useful in deep formats. 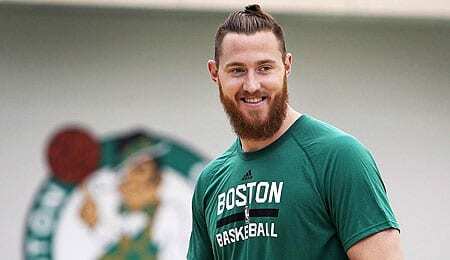 Baynes’ performance has not gone unnoticed by opposing coaches (see video below). Terry Rozier, PG, Boston Celtics (ESPN: 22.1 per cent; CBS: 47 per cent): Rozier has already taken a much bigger role off the bench for the Celtics this season, but with Kyrie Irving getting knocked out of the game Friday with a suspected concussion, we got to see what Rozier could do in extended minutes. It was impressive. Rozier didn’t shoot well, yet still went off for 15 points with seven rebounds, four assists, two treys and two steals. Coming off a 14-point effort in the previous game, you can see that his scoring is starting to come around, making him a nice target. Always a bench player, Rozier could get a chance to start if Irving is sidelined, but even if he remains in the second unit, he’s sinking more buckets this season. We’d definitely like to see him improve his shooting touch before really investing heavily in him, but the fact that he has the flexibility to fit into different types of lineups that Coach Brad Stevens tries to employ should guarantee him decent PT. Brooklyn PG D’Angelo Russell has been a bit inconsistent with his scoring lately, but he came through when it mattered Friday, scoring 11 of his 21 points in the fourth quarter as the Nets snapped a four-game skid against Portland. He also dished nine dimes, giving him four straight games of at least six assists. We love the fact that Russell’s rebounding has improved in his first season in Brooklyn, but it would be nice to see his outside shooting touch return. Detroit’s amazing start continued as Andre Drummond went off for 16 points, 20 rebounds, two blocks and a career-best seven assists on Friday. Back-to-back 20-board games? Woah. Portland centre Jusuf Nurkic bounced back from an off game with 21 points on Friday, despite sitting most of the fourth quarter. His PT is down a couple of minutes from what he was getting after landing on the Blazers last season, but his touches are way up. Inconsistent Atlanta SG Kent Bazemore shook off a couple of poor shooting games by canning 8-of-16 en route to 22 points on Friday. It was a phenomenal all-around game for him as he nailed 3-of-6 from downtown, was a perfect 3-for-3 from the line and added five boards, five assists, three steals and a block. There’s a chance Bazemore is available in your league, too. Milwaukee had lost four straight games before PF Giannis Antetokounmpo took matters into his own hands on Friday with sixth double-double of the season — and fifth over the last eight games. Oh, and he added five assists and four blocks. The improvements he has shown every season boggle the mind. Where is his ceiling? Add toughness to Boston’s rookie Jayson Tatum’s resume. After shaking off an ankle injury that limited him to nine minutes on Wednesday, he played 31 minutes Friday and scored 16 points while continuing his amazing shooting (fourth straight game of at least 50 per cent field goal percentage). This kid can score. Every now and then, 40-year-old Manu Ginobili has a turn back the clock game. On Friday, the Spurs’ two-guard nailed 7-of-10 from the field (1-for-3 from downtown; 3-for-3 from the line) to pile up 18 points in 25 minutes, with three assists, two steals and a block. Ginobili might still have some use in a deep format. The Hornets got off to a nice start, but have now dropped four straight as Kemba Walker has slumped a tad. He’s averaging under 16 points over this skid, but he helped in other ways Friday with a great FT shooting performance, 11 assists and a steal.